A team that works well together is not a chance event. The challenge is how to build relationships within the team to unleash team power. The TEAM BUILDING PROGRAM moves the relationship building into high gear! 1. Who am I and Who are We? Using the Myers Briggs Type Inventory (MBTI) and possibly other instruments, participants gain insight into their own styles as well as the collective team profile. This insight can help identify potential strengths and needs of individuals and the team. Through this knowledge, differences are valued, resulting in more effective communication and decision-making. Through pre-meeting interviews or surveys, team members’ views, needs, and expectations are collected. A summary of findings is presented at the meeting. Team challenges and experiential activities provide an opportunity for self / team observation and action learning. 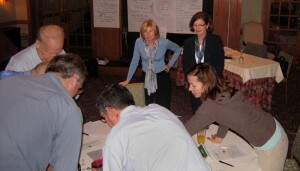 Through facilitated exercises and discussions, the group develops a shared vision of the team’s purpose and potential. If needed, attention is paid to clarifying team roles and responsibilities and developing team norms and agreements. Specific action plans and next steps are clearly defined for the team’s ongoing effectiveness. On going coaching for team leader or team members is available to ensure results. The program content and length are custom developed to address the group’s needs. Sessions can be from 1, 2, or 3 days. Special areas of focus may include communication, innovation, change, leadership, and / or conflict resolution.